In the early days, 3D printing was used almost exclusively for creating automotive prototypes for checking form and fit. Those prototypes tended to be built using selective laser sintering or binder jetting, resulting in aesthetically pleasing, but fairly weak, parts. Nowadays, more robust 3D printing technologies such as fused filament fabrication (FFF) are being increasingly used in automotive manufacturing, not only for prototypes, but also for rapid tooling and even end-use parts. The first company we will look at in this article is UK-based Eventuri. Eventuri manufactures high-performance carbon fiber air intake ductwork for a range of high-end models, including the BMW M-Power and Audi RS ranges. The complex geometry of the ducts is designed in CAD first, and then the airflows through that geometry are simulated in a computational fluid dynamics package. Obviously, carbon fiber–reinforced plastic components are expensive to manufacture due to the costly mold-making process, so it is perhaps no surprise that the company has turned to 3D printing to test the form and fit of these components before they invest in the molds required for final production. For manufacturing the prototypes, Eventuri invested in an Ultimaker 2 and the Ultimaker 2 Extended+ printers. And, of course, 3D printing not only assists with creating sturdy prototypes to check the form and fit, but also allows the company to iterate the designs rapidly before going to final production. Eventuri prefers to print its prototypes with PLA material and, when it starts a new project, it runs two printers day and night, allowing between six to 10 large pieces to be printed over seven days. That is rapid prototyping indeed. Although Eventuri is currently designing for Audi and BMW, it has its eyes on a much higher prize. In the future, it hopes to be designing air intakes for Ferrari, Porsche and other high-end supercars. 3D printing has proven itself a valuable ally to the field of rapid tooling, as Volkswagen Autoeuropa has discovered in its assembly plant in Portugal. When a new model of a particular car hits the market, the components of the car change from the previous version, as do to the workflow and associated tools. These assembly tools take a long time to develop and manufacture and are costly, as well. In addition, flaws that may not be realized during the design of these tools can manifest on the factory floor—that’s not a good scenario in a plant where 100,000 cars are produced annually. Time is definitely money in the automotive manufacturing world, so the ability to produce quality tools on time, and iron out any bugs in a timely manner, is paramount. Before Volkswagen Autoeuropa had invested in its Ultimaker printers, jigs and other tools for the assembly line would take weeks just for a mockup to arrive at the plant. Now that all of the tool manufacturing is done in-house, the lead time is slashed to mere days. And if there are any issues with the functionality of the tools, then there is no need to send them back to the third-party vendor and wait several weeks for a redesign. The new iteration can be designed and manufactured in days. Take for example the image above. In this example, we can see the white, 3D-printed wheel protector. This tool is designed to protect the soft alloy metal of the wheel from the hard socket used to fasten the wheel nuts. Previously, this wheel jig would have cost in the region of EUR€800 from a third-party vendor and would have taken 56 days to deliver (assuming they got it right the first time). Now, thanks to the Ultimaker 3 printers, the cost is reduced to EUR€21 and the lead time is reduced to just 10 days. 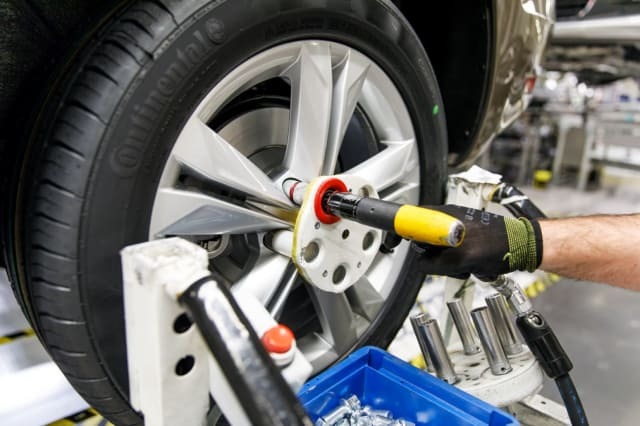 Currently, 93 percent of tools that were previously outsourced for manufacture are made at the Volkswagen Autoeuropa plant, allowing for a 91 percent reduction in tool development costs and a 95 percent reduction in tool lead times. What do those percentages mean in real terms? In 2016, the plant saved EUR€150,000, and that figure has been predicted to rise to EUR€325,000 for 2017. Not a bad return of investment from purchasing just seven 3D printers. Another advantage of printing tools in-house is that the engineers no longer have to deal with the purchasing department, meaning less paperwork and less headaches. Engineers can get on with doing what they do best… engineering! And so, we reach the final case study—and what better way to end our exploration of automotive 3D printing than with actual, functional end-use parts? Tucci Hot Rods, a New York–based auto customization company has been in business since 1997. It deals in different auto modifications ranging from engine swaps to bodywork (and everything in between). By definition, custom auto modification focuses on very small production runs, with many parts being totally unique. In the past, if a customer wanted custom accessories, they would either need to be purchased from a third-party custom part specialist, or else be fabricated in some other time-consuming and expensive manner (such as laser cutting or CNC milling). Well, for certain plastic parts, those days are certainly numbered. Since purchasing an Ultimaker 2 Extended+, Tucci Hot Rods has tripled the speed at which these parts are produced, while reducing the cost of manufacture by a whopping 90 percent. Take, for example, its recent Ford Fiesta ST project (pictured below). Before Tucci Hot Rods purchased a 3D printer, a custom job like that would have taken between six and 12 months. Now that the company is designing and fabricating in-house, and not having to rely on the long lead times associated with outside vendors, the entire car was finished in just two months. The Ford Fiesta build itself was literally festooned with parts printed on the Ultimaker printer. The dashboard featured a custom-printed speedometer dial housing, and both rear lights and main headlamp cluster housings were 3D printed. In addition, there were 3D-printed vents incorporated into the hood and the wheel arches. Vent being printed (left) and the final product on the car (right). In terms of cost, Tucci Hot Rods estimate that an average of USD$500 is saved per part, compared to its previous traditional machining methods. Designer Don Tucci was impressed by the flexibility and time-saving allowed by the 3D printer—so much so that he said he will try to use it on all future builds. Now you have seen how a desktop 3D printer can have such an impact on the automotive world, from the prototype phase all the way to the final product itself. No doubt there are hundreds of other examples of how users have been modding their own rides with the aid of FFF printers. Are you one of them? Do you own an Ultimaker printer, and have you made some cool stuff for your car? Let us know in the comments. We’d love to hear about your ideas!